Moving from the Old World to the New, H. M. Muhlenberg established the shape of Lutheran parishes and Lutheranism in general in America during a 45-year ministry in Pennsylvania. Born at Einbeck, Germany, in 1711 and baptized Heinrich Melchior Mühlenberg, he came to the American colonies in 1742. 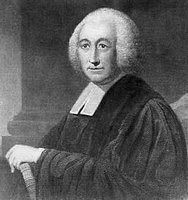 A tireless traveler, Muhlenberg helped to found many Lutheran congregations and was the guiding force behind the first American Lutheran synod, the Ministerium of Pennsylvania, established in 1748. He valued the role of music in Lutheran worship (often serving as his own organist) and was also largely responsible for preparing the first American Lutheran liturgy (also in 1748). We remember Muhlenberg as church leader, journalist, liturgist, and — above all — as faithful pastor to those in his charge. He died in 1787, leaving behind a large extended family and a lasting ecclesiastical and familial heritage. Although his beliefs and practices may have been tinged with pietistic tendencies, Muhlenberg paved the way for a wide variety of Lutherans — from orthodox and doctrinally sound to Lutheran in name only — to establish their respective presences in the United States. Among his heirs were churchmen, politicians, and soldiers, including sons Peter Muhlenberg, a major general in the Continental Army and Frederick Muhlenberg, the first United States Speaker of the House. Heavenly Father, Shepherd of Your people, we thank You for Your servant Henry Melchior Muhlenberg, who was faithful in the care and nurture of Your flock, and we pray that, following his example and the teaching of his holy life, we may by Your grace grow into the stature of the fullness of our Lord and Savior Jesus Christ; who lives and reigns with You and the Holy Spirit, one God, now and forever.